The aim of SUMMA is to significantly improve media monitoring by creating a platform to automate the analysis of media streams across many languages, to aggregate and distil the content, to automatically create rich knowledge bases, and to provide visualisations to cope with this deluge of data. 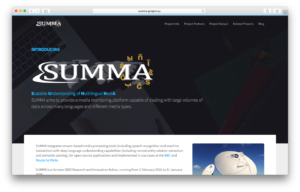 SUMMA integrates stream-based media processing tools (including speech recognition and machine translation) with deep language understanding capabilities (including named entity relation extraction and semantic parsing), for open-source applications and implemented in use cases at the BBC and Deutsche Welle. For more information please visit www.summa-project.eu. The project SUMMA has received funding from the European Union’s Horizon 2020 research and innovation programme under grant agreement no. 688139.